Definition at line 26 of file CStepMatrixColumn.h. Definition at line 28 of file CStepMatrixColumn.cpp. Definition at line 34 of file CStepMatrixColumn.cpp. References abs64, C_INT64, CBitPatternTreeMethod::GCD(), getMultiplier(), and mReaction. Definition at line 96 of file CStepMatrixColumn.cpp. Definition at line 113 of file CStepMatrixColumn.cpp. References CVectorCore< CType >::array(), CZeroSet::getNumberOfBits(), CZeroSet::isSet(), mReaction, mZeroSet, and CVector< CType >::resize(). Definition at line 50 of file CStepMatrixColumn.h. Definition at line 108 of file CStepMatrixColumn.cpp. Definition at line 103 of file CStepMatrixColumn.cpp. Referenced by CBitPatternTreeNode::CBitPatternTreeNode(), CBitPatternMethod::combine(), and CStepMatrix::getUnsetBitIndexes(). Definition at line 150 of file CStepMatrixColumn.cpp. 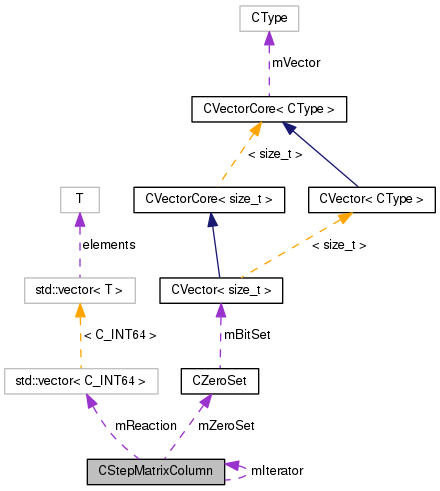 Referenced by CBitPatternMethod::buildFluxModeMatrix(), CStepMatrix::CStepMatrix(), and CBitPatternMethod::initialize(). Definition at line 63 of file CStepMatrixColumn.h. Definition at line 155 of file CStepMatrixColumn.cpp. Definition at line 45 of file CStepMatrixColumn.h. Definition at line 74 of file CStepMatrixColumn.h. Referenced by setIterator(), and ~CStepMatrixColumn(). Definition at line 72 of file CStepMatrixColumn.h. Referenced by CStepMatrixColumn(), getAllUnsetBitIndexes(), getMultiplier(), getReaction(), operator<<(), push_front(), and truncate(). Definition at line 70 of file CStepMatrixColumn.h. Referenced by getAllUnsetBitIndexes(), getZeroSet(), operator<<(), and unsetBit().